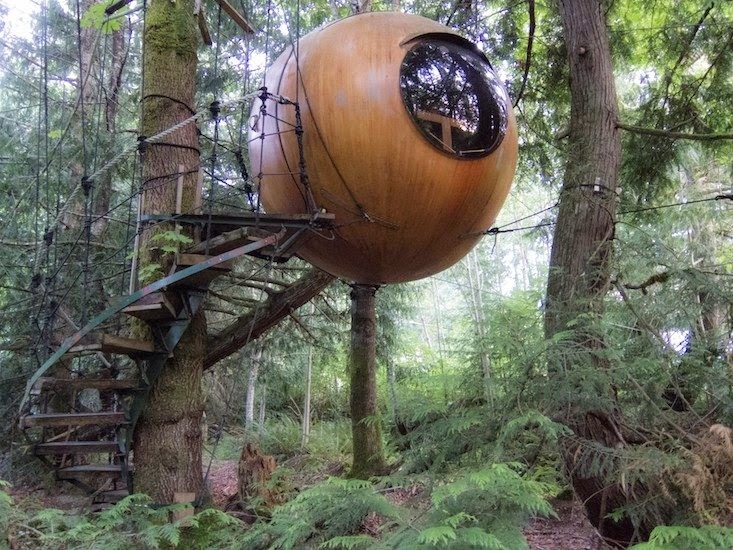 These sphere shaped guest rooms which hang from the trees in the west coast rainforest of Vancouver Island in British Columbia are the perfect get away for those seeking natures’ solitude. Each sphere is embellished with round, porthole style windows for viewing the landscape outside, while outhouse style restrooms are available on the ground nearby. The spheres are secured to the trees by a web of rope, hanging like pendants in the fresh west coast air, and are accessible by boardwalk style staircases and walkways. Surrounded by an enchanting forest, the spheres gently sway in the breeze, leaving guests with time to rest and relax in comfort. There are 3 handcrafted guest spheres available, all located on private property to ensure calming, natural solitude and an opportunity for guests to truly feel the presence of the forest. The spheres range in sizes that will accommodate between 1-3 people, and are available year round starting at $155 per night for 1 person.